Become part of Celtic Woman! 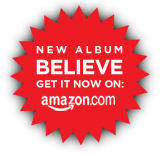 Celebrate the release of the new Celtic Woman CD and live DVD by joining me in the #BELIEVE Mosaic at http://2mosai.cc/believe. Use Twitter or Facebook to add yourself! Q: How do I add myself to the mosaic? Q: How do I find myself in the mosaic? A: Mouse over the mosaic and click the "Find Me" button. It may take a couple of minutes for your picture to appear. Because of color requirements, not all picture will appear in the mosaic.